Happy National Chocolate Cake Day! Did you know that chocolate cake wasn't even a thing until 1847? I had no idea! It seems that chocolate was primarily used for drinking prior to that. Now I love a good cup of hot chocolate, but I can't imagine a celebration without chocolate cake! I looked through lots of recipes on Pinterest and cookbooks trying to chose what cake I wanted to make. 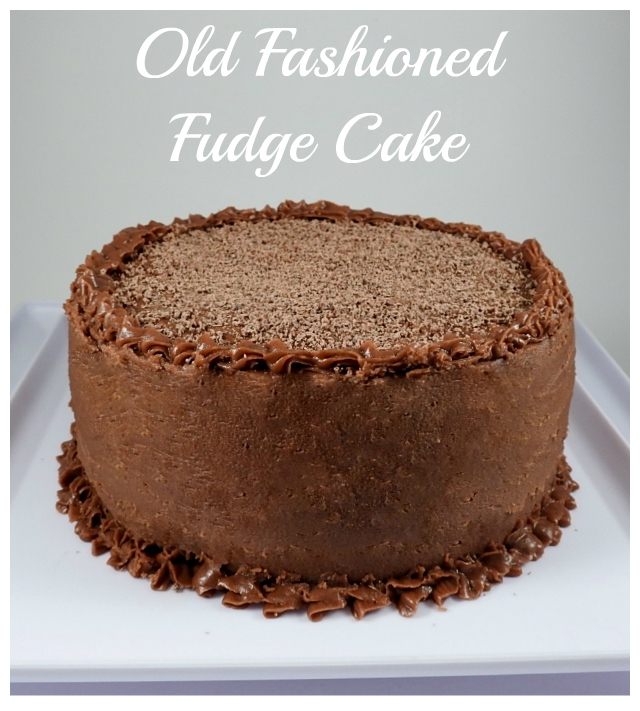 This Old Fashioned Fudge Cake from Mary S. caught my eye because it made a 6" round, which is the perfect size for just the 3 of us. The cake itself isn't overly sweet, so it balances nicely with the frosting. The only thing I'd do differently next time is to split the cake into two layers and put some of the frosting in between. It spreads and pipes beautifully, and then sets up nicely. I used a rotary grater on some chocolate chips for the top of the cake. Thanks to Camilla for hosting our #NationalChocolateCakeDay celebration, and to all of the other Festive Foodies for sharing their recipes! Be sure to go and see what they made using the links down below. In a large bowl, cream shortening and sugar until light and fluffy. Add egg, then egg white, beating well after each addition. Stir in vanilla. Combine the flour, cocoa, baking soda and salt; add to the creamed mixture alternately with milk, beating well after each addition. Stir in water until smooth. Pour into a greased and floured 6-in. round baking pan. In a small saucepan over low heat, combine the sugar, cream and butter. Bring to a boil; cook and stir for 2 minutes. Remove from the heat; stir in marshmallows and chocolate chips until smooth. Spread frosting over top and sides of cake. Thanks so much for posting a smaller cake recipe. Many times I want cake but don't bother because there is only the three of us. That is a beautiful cake, Jolene! Thanks for joining me. A marshmallow fudge topping is right up my alley! This is what my life has been missing! ;-) It looks absolutely amazing! That looks amazing. I wish I had your cake skills!